A video recently doing the rounds on Facebook included a segment from the BBC comedy quiz show QI. The video asks which of avocados, almonds, melon, kiwi or butternut squash are suitable for vegans. The answer, at least according to QI, is none of them. Commercial farming of those vegetables, at least in some parts of the world, often involves migratory beekeeping. In places such as California, there are not enough local bees or other pollinating insects to pollinate the massive almond orchards. Bee hives are transported on the back of large trucks between farms – they might go from almond orchards in one part of the US then on to avocado orchards in another, and later to sunflower fields in time for summer. 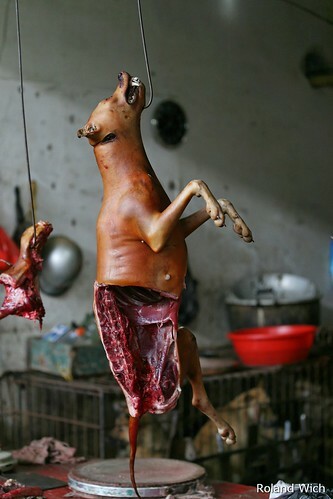 (Above image here) Consider the infamous Chinese dog market. Dogs are rounded up, sometimes beaten while still alive (ostensibly to improve the flavour of their meat), killed, and eaten. Everyone I know thinks it’s obscene, and that the suffering of the dogs cannot possibly be outweighed by the sensual satisfaction of the diners, the desirability of not interfering, colonially, with practices acceptable in another culture, or by any other consideration. It’s just wrong. ‘It’s just wrong’ is the observation that moral philosophers exist to denounce. They draw their salaries for interrogating this observation, exploding its naivety, and showing that the unexamined observation is the observation not worth making.